Florida isn't just for vacationers and retirees anymore. It seems the Sunshine State is also a hub for employers and businesses eager to expand and hire more workers. Forbes.com recently released its annual list of the 200 Best Places for Businesses and Careers, and, among those places, five Florida cities ranked in the top 10 for U.S. cities with the highest job growth. Cape Coral, Fla. held the top spot for cities with the highest job growth. Las Vegas, Nev. ranked second, followed by Naples, Fla. and Sarasota, Fla. McAllen, Tex. rounded out the top five. If you need a change of scenery and are thinking about relocating in the next few years, consider one of the following 10 cities, which are projected to have the highest job growth this year, as reported by Forbes.com and based on five-year projections from Economy.com. Cape Coral is 5th Fastest Growing City in U.S. The City of Cape Coral continues to be one of the fastest growing cities in the country according to the U.S. Census Bureau. The Cape grew at a 5.8 percent clip in the 12-month period ending July 1, 2003. This places Cape Coral at No. 5 for cities with more than 100,000 people and at No. 10 regardless of population. Port St. Lucie was the only other Florida city on the list. Last year, Cape Coral was the 9th fastest growing city, and officials had expected the city to remain in the Top 10 again this year. "We know how many building permits we issued last year, and we know how many building permits we are issuing this year," said City Manager Terry Stewart. "We expect Cape Coral to remain on everyone's radar screen for the next few years." Cape Coral grew to 118,737 people by July 1, 2003. The City estimates that the current population is more than 131,000 residents, and the City is on pace to issue more than 5,000 single-family home permits this year. "Cape Coral is a very attractive community for many reasons," said Stewart. "We have sunshine, waterfront property, access to the Gulf and lots of potential. I am not surprised that people from all over the world want to move to our city." *Salary information provided by CBsalary.com. Other data compiled by Forbes.com and CityTownInfo.com. Cape Coral: With spectacular natural beauty and unparalleled quality of life, Cape Coral in Lee County is the perfect environment for outdoor enthusiasts, beach lovers, retirees, students and hard-working families. Located on southwest Florida's Gulf Coast between Naples and Sarasota, Cape Coral is often referred to as “Paradise” or “Boater’s Paradise” by the local residents. Four hundred plus miles of saltwater and freshwater canals – ideal for fishing and boating – affordable housing, outstanding education and a low crime rate are just a few of the gems in the Cape’s crown. Consisting of 114 square miles, Cape Coral is second only to Jacksonville in terms of land mass and is home to more than 120,000 residents. Industries that provide employment in Cape Coral include tourism, educational, health and social services, retail trade, construction, and professional, scientific, management, administrative and waste management services. Students in Cape Coral attend excellent schools within the Lee County Schools’ choice system. The many schools located within Cape Coral play a key role in community life. Several have been recognized with National Schools of Excellence Blue Ribbon awards. Many colleges and universities are in proximity for those who wish to attain a degree in higher education. 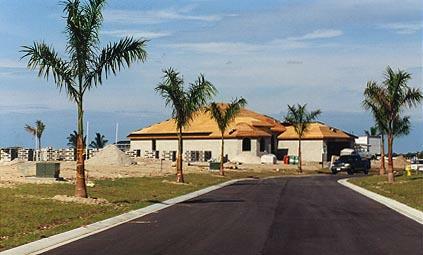 The city of Cape Coral is considered one of the hottest real estate markets in the entire country. It offers a diverse mix of property selections, such as gated communities, homes built around local golf courses, fine homes and estates overlooking the Caloosahatchee River, others built with Gulf access and on freshwater canals, active retirement communities, and high-rise condominiums. Cape Coral is one of many tropical cities nestled on the southwestern coast of Florida, surrounded by more than 100 barrier islands. This area of Lee County is affectionately called "The Lee Island Coast." When the barrier islands were formed some 5,000 years ago, a productive ecosystem was created, allowing for permanent settlement of the area. Attracted by the bountiful supply of fish and shellfish, the Archaic people were the early predecessors of the Calusa Indians. Spanish explorer Ponce de Leon discovered a thriving Calusa culture when he landed on the Lee Island Coast in 1513. Founded in 1957 by developers Jack and Leonard Rosen, Cape Coral was incorporated in 1970 and has been one of the fastest growing cities in Florida ever since. It is a charming city with a warm year-round climate and a highly skilled and dedicated work force. Tourism is the number-one industry in Lee County, creating more than 36,000 full- and part-time jobs and earning more than $900 million in business annually. It is a world of tropical wildlife, spectacular sunsets over sparkling waters, romantic getaways and hundreds of islands to explore. Cape Coral has more canals than the Italian city of Venice. It is home to the burrowing owl, a protected species of small owls indigenous to the area, as well as manatees, gopher tortoises and the American bald eagle.